Currently, the TSP has a fee of 0.03%, one of the most cost-effective retirement platforms in existence. Assuming the agent has the investment advisory licences to do so, they can recommend that the client roll their $1,000,000 TSP account into a high fee (rider fee 1.25%+) annuity, and still receive a $100,000 commission. Should that occur, the client may face $12,500 more per year in fees, lower performance, and a “lock-up” period in the form of a surrender charge. Clearly, this is not in the best interest of the client, yet the agent will still be legally permitted to call himself a “fiduciary”. Even more unsettling, the financial advisor has the choice to present annuities that provide him with the highest commission payout possible. Though one annuity may not have an annual fee at all, or pay the client a higher return, the advisor has full discretion over what is recommended to the client. The advisor has no obligation to recommend the better product, and can easily for-go a better performing annuity that pays him 5% ($50,000) on $1,000,000, so that he may earn 10% ($100,000) for the poor annuity product. Should the client unknowingly decide to go with the annuity that pays the agent more, there is the potential of hundreds of thousands of dollars to be lost in performance opportunity cost and annuity fees over 30 years. The client would have simply been better off never meeting the advisor at all, instead leaving the TSP retirement account invested in its low-cost platform. This unfortunate conflict is constant within the financial services industry. As such, we are passionate about making transparency and honesty a focal point of advisor-client relationships while providing comprehensive advice for both investment strategies and insurance products. To further illustrate how commissions impact annuity investor returns, we have taken a fixed indexed annuity illustration from the largest insurance company in the world and compared projected performance to its fee-only counterpart. To start, this particular product is one of the most competitive products this company offers. Agents who sell this annuity must accept a significantly lower commission rate to begin with, yet the benefit to the client by removing this commission is astonishing. In this example, a 60 year old male is investing $1,000,000 in the competitive annuity from the largest insurance company in the world. For the sake of this example we will call the commissioned annuity, Annuity A. The non-commissioned version of this annuity will be called Annuity B. The investor may begin income at any point with this product, but in this example he has chosen to begin income on year 7. This product has a 1.05% rider fee, and its growth rate is determined by the S&P 500 on an annual point-to-point basis. This interest credits from the S&P 500 will increase the accumulation (account) value of the investor, and increase the lifetime income payment once the withdrawal period begins. The insurance company sets a cap on annual interest credits. Annuity A has a cap rate of 5.75%, yet Annuity B will have the cap rate increased to 7%. This is because the insurance company has increased the cap rate to the investor, a direct result of the reduced cost of the product’s sale without a commission to an agent. This already competitive product (Annuity A) begins income on year 7 at $71,677. Annuity B begins income at $78,389 on year 7. This $7,967 difference is obviously significant, but allowing time increase the difference in the performance of the two products shows how dramatic the removal of the commission can be towards the returns of the investor. 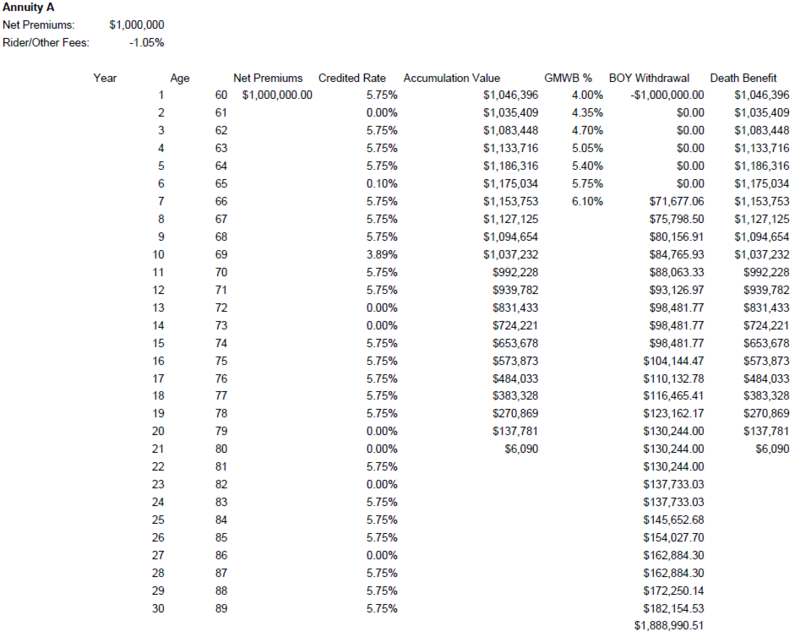 Over 30 years, the difference in income between Annuity A and B is $616,790 for a 60 year old male investing $1,000,000. Now if we were to invest $2,500,000, this difference would increase to $1,541,975. For an investor investing $10M, this difference would skyrocket to $6,167,901. To reiterate, this is the difference in projected income from simply removing the commission from annuity A. Undoubtedly, the removal of the commission can have massive difference in investor experience, especially as the amount of money and time invested within the account increases. FIAs are posited as fixed income replacements, not equity replacements, setting proper performance expectations for advisors and clients. We can apply the same commissioned-free insurance product example to any insurance or annuity program. This includes Variable Annuities, Buffer Annuities, Fixed Annuities, Variable Universal Life (VUL), Indexed Universal Life (IUL), Universal Life (UL), or Whole Life Insurance. The client will always benefit from the removal of the commission paid out the the agent. The monetary value of this removed commission exponentially increases with the size of the investor’s account. The massive difference in performance can also be seen in variable annuities. Variable annuities provide a tax-deferred investment vehicle, and offer insurance benefits such as income or a death benefit. To pay for this benefit, insurance carriers will charge a “mortality and expense” fee. The amount of this charge is directly impacted by the commission paid to the agent at the time of the contract’s issuance. Hidden fees clients may not be aware of. Investment restrictions often imposed. 60/40 investment limitations and/or managed volatility investments are commonplace. Many of Sentinel's products offer investment flexibility with variety of extensive underlying fund options - often less expensive than comparable options on the market. Leveraging the benefits of tax deferral and downside protection can help individuals grow their wealth. Our solutions include an innovative products designed to provide a buffer of downside protection on a low-cost indexed investment, as well as a variety of low-cost, investment-only variable annuities. Our clients want income they can rely on. We offer a range of commission-free products designed to help provide income in a cost-effective way. 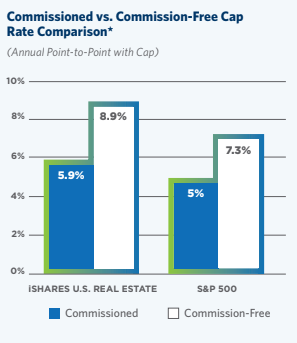 Commission-free annuities can provide greater levels of guaranteed income, mitigate longevity risk, guaranteed growth, and certain tax withdrawal strategies. Traditional, commission-based annuities are notoriously expensive. Sentinel provides access to a variety of repriced, commission-free products that can reduce fees and investment costs. Talk to our advisors to explore cost savings, discover ways to potentially improve death benefits, and create efficient withdrawal methods or expend investment selection. Using insurance to protect principal can provide meaningful benefit to an individual’s portfolio, as well as their peace of mind. Our commission-free solutions can provide hedging strategies, fixed returns or downside protection. Product & Strategy Audit: Sentinel performs an audit of investment and insurance strategies currently used. This provides a basis for Sentinel to intimately understand strategies, knowing when to recommend them for the needs of the client and their plan, aiming to implement the most effective strategies available to the industry. Client Review (existing insurance & investment holdings): We work with clients to review existing assets and insurance coverage to explore whether client needs are being met in the most efficient way possible. When appropriate, we will provide multiple options to cover each goal or risk, which may improve client long-term outcomes. Implementation: If the client decides the investment or commission-free insurance strategy is right for them, Sentinel processes the implementation of the recommendations for both investments and insurance.